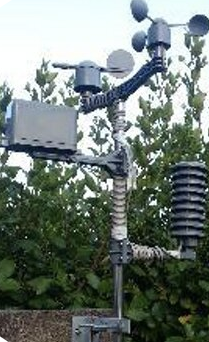 It seems that my personal weather station is going to be off line for several months (or maybe forever), so I thought I ought to write a short blog post to explain the history of the station and why I have to take it off line. It is a good example of how much work can be involved in keeping a service running despite the fact that the service is supposed to be completely automatic. My story started during the cold winter of 2010 in Ireland. The weather was so severe that this cold snap has it's own wikipedia page. As a result, I became very interested in weather and I dropped a strong hint that I wanted a weather station kit from Maplin as my Christmas present. This kit included some software to upload my weather data to the internet. This seemed like a cool idea to me, but the software only worked on Windows and I didn't like the idea of leaving a windows PC running 24/7. I used Google to look if there was other software I could use and found several open source options. Eventually I picked a python library pywws and I staredt publishing to my personal weather underground site in March 2011 with a Tonido Plug (an Ubuntu Linux based plug computer) doing the hard work. In April/May 2015 my plug computer died a natural death due to overheating. Instead of buying a new plug I replaced it with a Raspberry Pi because that had been released in the meantime and it was the new cool thing to use for hobby projects (it was also smaller and cheaper than a new Tonido plug). As part of setting up the Raspberry Pi, I downloaded a new version of pywws. I noticed that it now had support for uploading to a number of new services including Twitter and so I established the @llweather account to store my tweets. I though other geeks might be interested in what I did an so I spoke at 3Dcamp Limerick in May 2015 At this talk, an audience member warned me that I was lucky to have a station still working because the normal lifespan is 2-3 years. This prediction was proven true when shortly afterwards the indoor weather hub smashed to pieces in an accident Apparently it is normally the outdoor equipment that dies due to the severity of the weather it is monitoring, but due to my own clumsiness my home office was a more severe environment than any Irish storm. It wasn't possible to buy a new hub unit so I bought a completely new kit. Luckily my old software configuration worked fine with the new hardware and service was quickly restored. The software was completely automatic, but I found that sometimes my site stopped sending updates and although it was normally easy to fix the problem, it took me some time to notice that there was an issue. Therefore I implemented a monitoring service based upon tweets or lack of same. Since my employer IBM had recently launched the Bluemix service I implemented this in NodeRed running on Bluemix. The monitoring software would send me a Twitter DM whenever it noticed that the weather station had stopped sending tweets or if it started sending blank tweets. There were several possible causes but I noticed that they were normally solved by tightening the USB cable and/or rebooting the Raspberry Pi. After a while I stopped investigating the cause and just tried simple solution. I only investigated the issue when this failed to solve the issue. In early 2017, the station started warning much more often often. Since these problems often solved themselves, I loosened the rules about when to issue a warning (e.g. 40 minutes without a tweet instead of 25 and ignore the first 2 blank tweets). However. the problem got even worse and I couldn't ignore it anymore. I suspected that the raspberry pi was at fault because it was getting old, but a new replacement was not significantly better. I eventually thought to replace the power supply and problem went away for 1 month. When I investigated. I noticed that the indoor hub was getting either no data or crazy data e.g. 51 degrees centigrade in Ireland. If this was Dubai it could mean hot weather, but in Dublin could only mean equipment malfunction. A quick Google said it was most likely a problem with dampness in transmitter unit. When I disassembled the unit there was indeed signs of water damage. Unfortunately, the recommended solution of leaving it in the hot press for a few days didn't solve the problem so I decided to buy a replacement transmitter. I eventually decided to retire the station for now and reconsider in Feb if I buy a spare when they become available. Overall I must admit I was surprised at how much work was involved in keeping a relatively simple service online.